Big 12 teams had a good showing in Week 1 of the 2014 college football season. The conference went 6-3 during the weekend, with Kansas having the lone bye. The three losses in the conference were Oklahoma State to defending National Champion and current No. 1 Florida State, West Virginia to perennial power and current No. 2 Alabama, and Iowa State to 3-time defending FCS National Champion North Dakota State. Both OSU (Advocare Cowboys Kickoff Classic in Arlington, Texas) and West Virginia (Chick-Fil-A Kickoff Game in Atlanta) lost at neutral sites. Of the six teams to win, three came against FCS teams (Texas Tech, Kansas State and TCU). However, only Texas Tech seemed to struggle in their win against Central Arkansas (even with Davis Webb’s 170 passing yards in 4th quarter). Even Baylor opened up the season, and the new McLane Stadium, against an FBS opponent (SMU). In Baylor’s win, Senior QB Bryce Petty did not play in the 2nd half, citing back soreness. It was also the Bears’ first shutout of an FBS opponent since Sept. 16, 1995 against NC State. 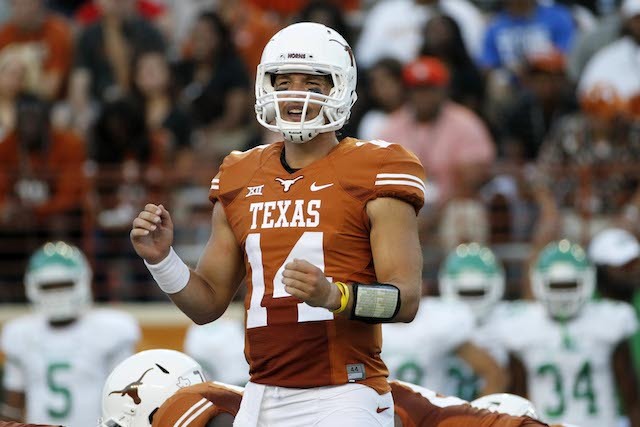 For Texas, the Longhorns opened the Charlie Strong era with a dominant win over North Texas, 3-7. However, David Ash was announced out for this week’s game against BYU after he took a hit against the Mean Green. One of the rumors circulating is concussion-like symptoms, but he is being evaluated by school medical personnel. Oklahoma State lost a ton of players to either graduation or the NFL Draft, but you couldn’t tell from watching their game on Saturday against Florida State. The Pokes played 14 Freshmen against the Seminoles, and picked off reigning Heisman Trophy winner Jameis Winston twice. At one point the Cowboys had the FSU lead down to three, but would fall to the defending National Champion 37-31.